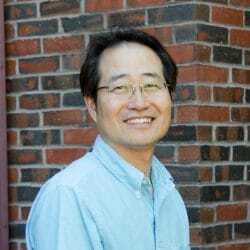 Ihn Sik Seong, Ph.D., is an Assistant Professor of Neurology at Harvard Medical School. Dr. Seong received his B.S with Molecular Biology and then received his Ph.D. in Biochemistry from Seoul National University, Korea. He pursued postdoctoral training in Dr. Marcy MacDonald’s laboratory at MGH. His research into the structural, biochemical and functional properties of the full-length huntingtin protein aims to pioneer the understanding of the cause of Huntington’s disease (HD) at its root cause. What is the impact of polyglutamine expansion, which is the causal mutation of HD, on full-length huntingtin structure and function? How can the altered structure and function of mutant huntingtin be amended? How can we determine the HD modifier out of strong candidates under GWA significant SNPs using biochemical separation methods combined with LC-MS/MS? Our overarching goal is to understand the impact of polyQ expansion on full-length huntingtin and to beneficially modify mutant huntingtin’s structure and functional activities. 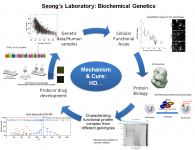 As summarized below for current projects, we have investigated the pathogenic mechanism of HD guided by human genetic study by developing biochemical cellular assays and reagents. Through the achievement and experience of HD research, our expertise has contributed to other genetic diseases through closed collaborations in CGM colleagues. 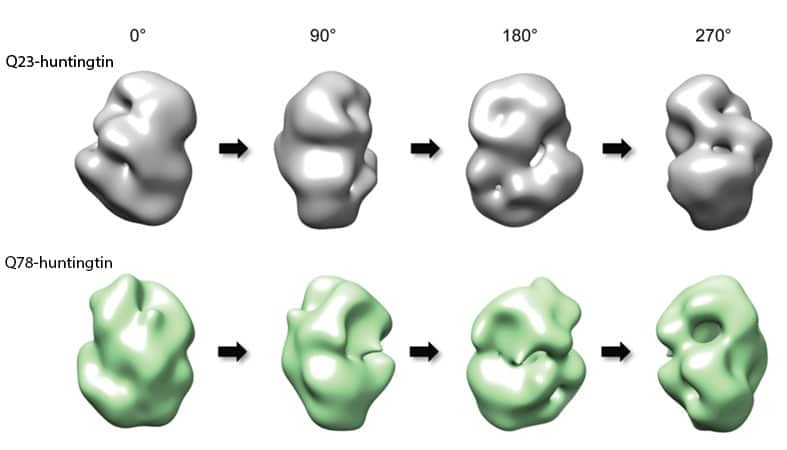 First 3D structure of full-length huntingtin: We laid the groundwork for understanding how the extreme N-terminal polyQ tract modulates the entire huntingtin protein structure and function and demonstrated a way to selectively amend mutant huntingtin activities. 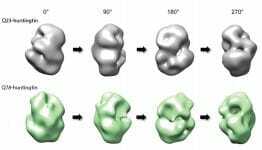 Recently, we reported the first 3D EM image and completed view of intramolecular interactions of both normal and mutant full-length huntingtin, revealing a spherical shape with a large cavity in the core. PolyQ length dependent PTM sites across full-length huntingtin: Consistent with this distinctive structure, we found that phosphorylation at eight of sixteen identified sites that span the entire huntingtin protein are sensitive to polyQ tract size, encouraging further exploration of our hypothesis that polyQ-length-dependent phosphorylation status influences huntingtin structure and function. DNA aptamer as a biochemical probe for full-length mutant huntingtin: Moreover, we successfully identified a set of DNA aptamers with strong binding properties to mutant huntingtin. These aptamers were able to eliminate the over-stimulation of PRC2 activity by mutant huntingtin in both our cell-free and cellular PRC2 assays, suggesting these reagents as promising modulators of huntingtin structure and function.